the company's revival through asset divestiture and debt reduction program. Brazil's Senate moves ahead with impeachment proceedings against President Dilma Rousseff, the interim administration of the vice-president, Michel Temer, has shuffled the cabinet and appointed new people to key positions, including replacing the current CEO of Petrobras, Brazil's National Oil Company (NOC). The new executive, Pedro Parente, will have a major challenge of putting Petrobras back to its tracks after years of political interference and corruption scandals. Although the impeachment charges against Ms. Rousseff are officially for budget-related fraud, she has lost a great deal of political support due to revelations about a large kickback scheme within Petrobras. The company, which was once seen as a rising star of the NOCs, is now struggling to survive in light of its tarnished credibility. Its fall would endanger a major economic sector of the country; yet, despite the controversy surrounding Petrobras, the oil industry could still aid Brazil's development provided that careful restructuring is undertaken by the incoming administration. Changes should include a slimmer, business-focused Petrobras working in a more competitive environment where its supply chain depends less on the NOC's capacity to invest. In hindsight, Petrobras was among the least likely NOCs to fall prey to political meddling and widespread corruption. First, it has an above average governance structure for a NOC, with shares listed on multiple stock exchanges (including in the United States), a board that includes independent members, as well as auditing and transparency requirements equal to those of public companies. Second, since the Brazilian oil sector opened to private companies in 1997, Petrobras has operated in a competitive domestic environment and internationalized oil fields in numerous countries, including in the U.S. Gulf of Mexico. Third, the company is known for its technological capabilities, having received the Distinguished Achievement Award from the Offshore Technology Conference (OTC) three times. Unlike other Latin American countries – such as Argentina where oil production stagnated, Mexico where production is declining, and Venezuela where production has ebbed and flowed in a cycle of expropriations and privatizations – Brazil's production curve shows remarkably stable growth (see Figure 1). The strength of these attributes masked the problems facing the company. After the discovery of pre-salt reservoirs in 2006, Petrobras launched an unsustainable investment spree financed by debt in anticipation of becoming an oil exporter in the near future. The company invested in four new refineries, returned to the petrochemical sector with new plants after taking leave of the sector in mid-1990s, and bought tankers to stimulate the revival of the domestic shipyard industry. Many of these large investments involved bribing political parties and senior management to the cost of between 1% and 3% of the net investment. Today, Petrobras' debt totals around $100 billion, which appears unpayable to some analysts. The company is selling assets to raise money and cutting future investments. Moreover, it is now forced to recognize its 2014 losses of R$ 6.2 billion paid in bribes and R$ 44.6 billion in impairment charges – registering in its balance sheet and indicating that some its assets have drastically lost value. Brazil's trajectory in oil and gas (O&G) bears a remarkable similarity to Mexico's in the late 1970s. Mexican President, José López Portillo (1976-1982), believed that developing the Campeche Bay area would radically change the country and make scarcity a thing of the past. This led to the fast-track development of the Cantarell field financed by extensive loans and foreign suppliers, allowing Mexico to enjoy the high oil prices following the second OPEC shock (García 1989). Production did increase, but the return on investment fell as interest rates rose, the world oil supply increased, and coordination problems within OPEC led to price drops in the early 1980s. Mexico was the first Latin American country to default on its debt in the 1980s, beginning a period known as the “lost decade” for the Latin American region. This story reads all too similarly to Brazil's current situation. First, in that the discoveries of large oil deposits led to a very optimistic forecast for the country; second, in that the government entered a period of fiscal expansion based on future oil income and supported by heavy investments of the NOC; and third, in that the global oil scenario changed – negatively impacting initial investments. However, there remain important differences that favor Brazil vis-à-vis the Mexican experience. Petrobras is a technically competent company and a leader in deep offshore oil production. Brazil also created backward linkages and sizable investments in R&D and human capital, whereas Mexico opted to develop an oil industry as an enclave (with foreign suppliers, imported technology, and poorly managed contracts). Lastly, Brazil's geology required heavy capital investment in development, which stimulated the entire economy, provided incentives for cost-reduction technologies, and served as a constraint to operational inefficiency of the NOC in its exploration and production (E&P) operations. To locate the sources of the company's losses, it is important to disaggregate the results of Petrobras by the two main sectors of the O&G value chain, the upstream (which comprises the E&P activities) and the downstream (which refers to refining and further processing of crude and natural gas). 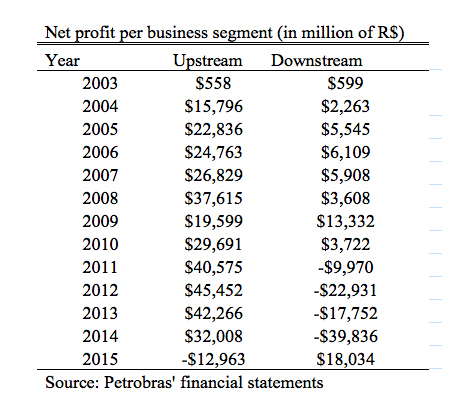 When comparing the net profit of the upstream segment versus the downstream, it is evident that, beginning in 2011, profits generated by the upstream subsidized downstream operations. In fact, most of Petrobras' losses came from domestic price controls on gasoline aimed at reducing inflationary pressures during Ms. Rousseff's first tenure and her reelection bid in 2014. In 2015, this process reversed as domestic prices in Brazil soared above international prices for gasoline and diesel, driving up profits in the downstream. Low oil prices affected the upstream, which forced Petrobras to engage in impairments, wherein it reevaluated its assets to reflect current market conditions. Broadly speaking, the picture that emerges is one suggesting that, until recently, the upstream business was very profitable, but the downstream segment was a money-losing machine. In addition, bribe rates were also higher in the downstream segment – which is not subject to regulatory local content clauses – a controversial requirement that pushes oil companies to buy from local suppliers for its upstream operations  . Mexico's Portillo was still in power to see the result of the mess he created while managing the Mexican economy. One of his last acts as president in 1982 was to nationalize the banking industry and to impose exchange rate controls. Despite the evidence in his last “Informe de Gobierno” (Mexico's State of the Union address), he shifted the blame to others and to conditions outside his control. Ms. Rousseff, who acted as Minister of Energy from 2003-2005, as Chief-of-Staff for President Luiz Inácio Lula da Silva from 2005-2010, and as president of the board of Petrobras from 2003-2010, is similarly accountable for what happened to the company – though she too denies wrongdoing. It is no surprise that her political downfall coincides with the deep crisis that the NOC now faces. Dilma may be forced to definitely leave the presidency soon, but Petrobras' problems will continue. In order to survive, Petrobras will have to shrink in size (as it is trying to do with its divestment plan) and reduce costs in the upstream so as to increase the profitability of its ultra-deep offshore drilling. Thankfully, cost-reduction in the upstream requires R&D, which is likely to generate spillover effects for the Brazilian economy. For this reason, the innovation budget should be preserved, and cuts should focus on non-core areas. 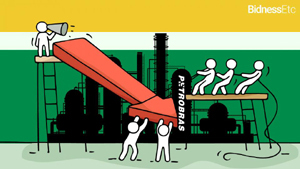 As Petrobras' new executive, Mr. Parente and his incoming administration should avoid asking the government for a bailout, which, although costly in the short-run, would alleviate the pressure towards divesting non-core assets of Petrobras. More broadly, the future of the Brazilian oil industry would benefit from more competition in both the upstream and downstream segments. In a fully competitive environment, the government would not be able to control gasoline prices as it did, and the end of Petrobras' monopsony condition would reduce incentives for extracting bribes from suppliers. Aldo Musacchio and Sérgio Lazzarini. 2014. Reinventing State Capitalism . Cambridge (MA): Harvard University Press. Renato Lima-de-Oliveira. 2015. “Local Content Requirements in the Oil and Gas Industry in Developing Countries: The Return of ISI? (September 8, 2015).” MIT Political Science Department Research Paper No. 2015-20. Benjamín García. 1989. La Política de Hidrocarburos en el Proceso de Reordenación Económica . México D.F: UNAM. Editor's Note: This commentary was originally published by Georgetown Journal of International Affairs , on June 20, 2016. Petroleumworld reprint this article in the interest of our readers.